This is my first ever Artist Trading Card. I was in a swap over at Soul Scrappers and this was my entry. The theme was "love". At first I didn't really know what to do with the card as they are about the size of a baseball card. 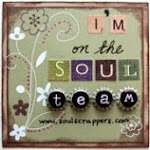 It was suggested to me to use them as embellishments for a full size card or for a scrapbook page so I thought perfect. I'll give it a try. The card you create is suppose to be a small piece of art that you created using whatever. It was fun to give this a go and now I am entering another swap for May. I'm looking forward to seeing what the other swapping ladies have created.